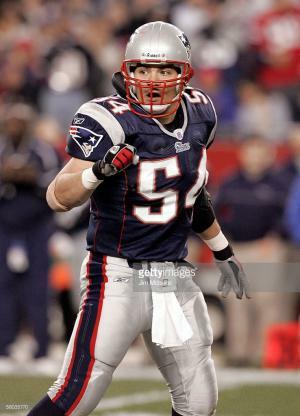 Tedy Bruschi, born on the 9th June 1973, in San Francisco, California USA, is a former linebacker in the National Football League(NFL), having played for the New England Patriots his entire career. He gained fame in college when he played for the University of Arizona, by becoming a two-time All-American. During his time IN the NFL, Bruschi won three Super Bowls as well as being named an All-Pro twice. Have you ever wondered how rich Tedy Bruschi is as of late 2016? According to authoritative sources, Bruschi’s net worth has been estimated at around $12 million, an amount earned during his long, successful career in the NFL spanning 1996-2008. As evident from his last name, Bruschi is of Italian heritage; his grandparents moved to America from Bedonia, Italy. Although he was raised in San Francisco, Bruschi attended Roseville High School, California, where he found his love for football; hHe went on to letter in football, wrestling, and track and field. His success in high school caught the eyes of college recruiters, and in 1991 he began studying at the University of Arizona, along with playing for their team, the Arizona Wildcats. He played with the Wildcats for 4 years, from 1991 to 1995, however, his college career started out roughly due to a pinched nerve in his neck. Bruschi ended up missing the first three games of the season in 1991, before coming back and playing two. Unfortunately, he then broke his left thumb and was consequently redshirted. However, in 1993 he ended up receiving All-American honors after posting 19 sacks as a sophomore. During his four years at the University, Bruschi recorded 185 tackles, 6 forced fumbles, and 52 sacks, which provided an impressive resume for NFL recruiters. Tedy Bruschi was selected in the third round of the 1996 NFL Draft by the New England Patriots; he stayed with the Patriots until the end of his career, in 2008. Although mostly playing defensive end in college, Bruschi was thought to be too small to play the position in the NFL, so he was moved to linebacker. He played every single game during his rookie year, and recorded 11 tackles and 4 sacks. The Patriots ended up going to the Super Bowl that year, where he recorded 2 sacks. The next year he ended the season with 30 tackles and 4 sacks, and also played every game of the season. Bruschi continued to find success in the NFL, becoming defensive captain in 2002. However, in 2005 he suffered a mild stroke, found to be connected to a congenital heart defect. Due to his rehabilitation progress, Bruschi announced that he would sit out the 2005 season, however, he surprised the league by returning on 30 October 2005, and played a pivotal role in the defeat of the Buffalo Bills. He was awarded AFC Defensive Player of the Week for his triumphant return, and at the end of the season was named the 2005 NFL Comeback Player of the Year. In 2009, amongst rumors of being released from the Patriots, Bruschi announced his retirement. During thirteen seasons with the Patriots, Bruschi posted 1017 tackles, 31 sacks, 17 forced fumbles, 12 interceptions, and 5 touchdowns. He is also the only player to ever return four consecutive interceptions for touchdowns. For seven seasons he was the Patriots defensive captain, and was a member of Patriots teams which reached nine playoffs, leading to eight division championships, five conference titles, and three Super Bowl rings; a further special achievement was in 2007, when he and the Patriots became the first undefeated team in NFL history. Bruschi is now an analyst for ESPN, which has also increased his net worth. Regarding his personal life, Tedy has been married to Heidi Bomberger since 1997, and they have three sons. Despite being known as a defensive brute on the field, Bruschi has an assortment of hobbies off the field. He is an accomplished saxophonist, having played with the Boston Pops. In 2007 he wrote a memoir about his stroke and the recovery process that followed, which was met with critical acclaim. He is a spokesman for the American Heart Association and has won various awards including the Ed Block Courage Award and the Senator Paul E. Tsongas Award for Exemplary Public Service. 1 Inducted into the Sacramento [California] Sports Hall of Fame in 2014. 3 Attended Roseville High School and currently has the record at the school for longest shot-put. 4 Last name is pronounced "brew-ski". 5 Attended the University of Arizona. 6 The Sacramento Bee ranked him number one on its list of the 100 best Sacramento area high school football players of all time. 7 Was drafted by the Patriots in the third round (86th overall) of the 1996 NFL draft. 8 Over the last three seasons, no NFL player has returned more interceptions for touchdowns than Bruschi. His four picks returned for scores between 2002-2004 equals the league-high total also achieved by Derrick Brooks and Phillip Buchanon. 9 Earned his first Pro Bowl nod in 2004 after a season in which he co-captained a Patriots defense that allowed 16.25 points per game, the second fewest in the NFL and the third fewest in franchise history. 10 Tied the NCAA Division I-A career sack record with 52.0 quarterback sacks, equaling the mark set by former Alabama All-American, the late Derrick Thomas.